One of the more difficult things to do when it comes to sewing is making a pattern bigger or smaller. It’s also a pretty common issue, as the free patterns you find on the Internet or sometimes even the ones you buy typically come in a particular size, which is obviously not going to fit everyone. And this is precisely where pattern grading comes in. It basically refers to the process of cutting apart a pattern, and spreading the pieces of the pattern slightly away from each other, depending on how large you want to make it. This process is often also referred to as slash and spread grading. Similarly, if you want to make a pattern smaller, you will be overlapping the pieces after cutting them, instead of spreading them away from each other as you would when enlarging the pattern. This can be both a waste of time and money! After all, fabric isn’t cheap! 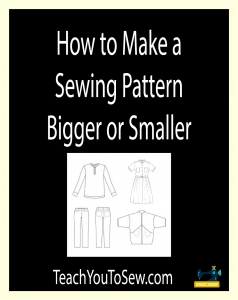 Now, we will be explaining how to enlarge a sewing pattern below. However, please note that for making a pattern smaller, the process is going to be the same except that you will be decreasing whenever you’re asked to increase and overlapping when asked to spread the pieces. Before trying to figure out how to enlarge a pattern and letting your sewing machine do its thing, you will need to find by what size should you be increasing the pattern. This is simply because it isn’t something set in stone as we all tend to grow at different rates, and the difference is much more pronounced between adults and kids than two adults. So the first thing to do here would be to take measurements, and compare it to the measurements of the pattern you will be resizing. So for instance, if your bust turns out to be 34”, and your pattern’s bust is 30”, you will need to increase it by 4”. However, you shouldn’t be going spreading out your bodice by 4”. This is because a bodice typically only covers 1/4th part of your body, which means that you will be dividing the difference by 4. So, in this case, we will be spreading out the bodice by 1” (4”/4). But wait, this gets a little tricky here. Although we have come to the conclusion that we need to spread out the bodice by 1” based on what we did above, there’s a bit more to it than that. Typically, the difference between most sizes is either just 1” or 2”. This means that you shouldn’t increasing the pattern by anything more than 2” at once. You can redraw, re-slash and spread it again after increasing it by 2”. So in this case, we should only be increasing the overall size by 2”, meaning that the bodice should increase by 1/2″ (2”/4). Once we are done with that, we can go on to increase 2” again from the new pattern to make it exactly the size we need. So how do you spread out the 1/2”? Well, you need to divide it into 3 as there are three vertical cuts. However, as dividing it into 3 can get a bit messy, we will simply divide it by 4. This gets us 1/8” (1/2”/4). You should now be adding this 1/8” to two of the three vertical cuts that are closest to the center (the front or the back center). As for the rest, you will need to add it to the vertical slash that’s closest to the side seam. This will help you in learning how to make a pattern bigger the right way, as you will understand that adding 1/8” to two vertical slashes and 1/4″ (the rest) to the one closest to the side seam would help you convert it into a completely new size pattern. It would also help you understand why you can’t just go about increasing the pattern as a whole to 110% of its size, as not all the parts need to increase at the same rate. Understanding how much to add to the length of the pattern is going to be a crucial part of learning how to grade a pattern. For children, it would depend on their measurements, which would primarily involve the difference between your child’s torso and the pattern size. When it comes to adults, though, things are not going to be as complex, since we don’t tend to get taller but only wider. That said, the increase in size for most adults is typically 3/8” per size. It’s something that works well for most people, and would fit pretty nicely, including at the waist. As for checking the accuracy of your work, a good way to do it checking the corners of the bodices. If you can draw a straight line across them, then you have probably got it right. However, it’s important to note that this method would only work when you have resized something that’s within a particular set of sewing patterns. In other words, the pattern sets for adults, children, and toddlers tend to be completely different, and can’t be resized. You will simply need to go for a different shape in such a case. Similarly, if you’re a petite woman wondering how to size up a pattern, know that you may need a different shape than what’s meant to be used for other women, and simply grading the pattern may not cut it for you. You may be able to do it in some cases, though, but keep in mind that it will require a lot of blending around the edges. Furthermore, the new pattern, too, would end up being different than the original pattern. Similarly, the “drawing a line” method won’t work for checking the fit. The only option you will have here is making a muslin cloth. This isn’t going to be much of a challenge for petite women, as all they will need to do is decrease the pattern’s size (vertically) by more than 3/8” per size, although they will still need to stick to doing it 1-2” at a time. For other women, things will get a bit trickier as it may take many different measurements for them to do the same thing. However, you can keep using cheap muslin cloth for this purpose, and once you manage to find the ideal size, simply store that piece of cloth as it would be worth its weight in gold for you, and would turn out to be incredibly useful every time you have to deal with pattern modifications. Finally, if you’re trying to grade pants or sleeves, then there are a couple additional things you may want to keep in mind, which are being mentioned below. The top part of your pant will have to be spread more than the bottom part of the pant, given that our hips demand a much more significant increase in the pattern size than our ankles. When working on the sleeves, you will need to increase the cap of the sleeves. However, it will have to increase by just as much as the bodice, in order to be able to fit it properly. In case you’re unable to resize your pattern, or simple want some new ones, we recommend getting your sewing patterns at Fabric.com. Want to learn more about sewing? Head on over to Chapter 4: Getting Started with Sewing.